Those of you who have heard me demonstrate the 40 meter, two-element horizontal phased array, especially under quiet winter-time conditions, have heard the 30 to 60 db of front-to-back the array is capable of generating. In summer-time conditions there is a lot of static and band noise that keeps the S-Meter reading upscale, so it is difficult to see much more than 20 db front-to-back ratio on the S-Meter, either on receive or transmit. Only during the quiet band conditions we have in the winter months will the S-Meter be able to show the 40, 50, and sometimes even 60 db front-to-back demonstrations. It seems impossible that a two-element antenna could have this much front-to-back, but I think the plots that I have done with NEC2 antenna modeling programs will offer some insight as to how this could be possible. 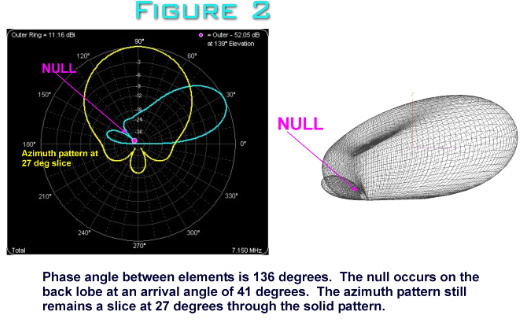 We typically see antenna elevation and azimuth patterns, but these two types of patterns are only 2-dimensional slices through the 3-dimensional pattern. 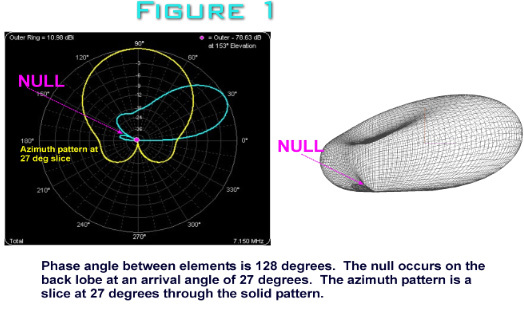 Choose the wrong azimuth angle for an elevation plot, or the wrong elevation angle for an azimuth plot, and you will get patterns that are totally misleading about the true antenna pattern. The best representation of an antenna pattern is the 3-dimensional plot that is available in several of the higher-end antenna modeling programs. Only then will the 2-dimensional slices at specific angles through the 3-dimensional pattern make sense. Think of these two slices as specific days of your entire life. You would not want anyone to judge your life by what they observed on only two different days, would you? 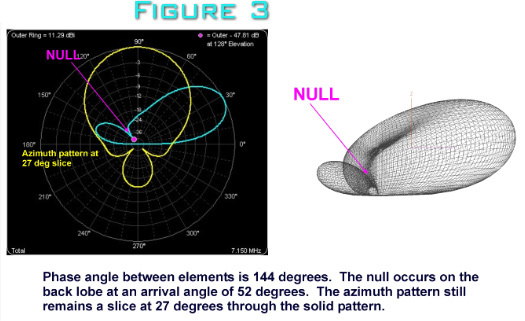 Nor should you judge an antenna by a couple of 2-dimensional slices though it’s 3-dimensional pattern. 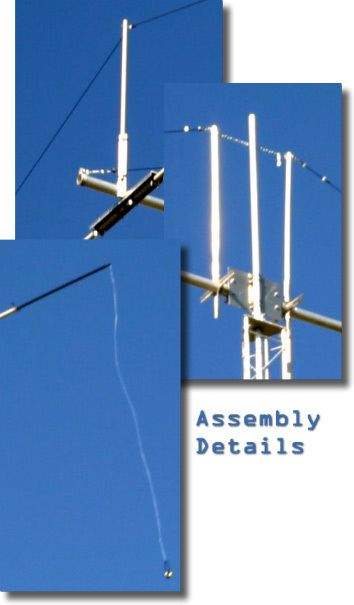 I used an antenna-modeling program called Multi-Nec by Dan Maguire, AC6LA, to investigate the two-element horizontal phased array. Multi-Nec uses Excel spreadsheet macros as the front end to various NEC2 engines. It comes bundled with a generic NEC2 engine, but can use the engines in other programs like EZNEC, EZNEC+, EZNEC-M Pro, EZNEC/4 Pro, NEC-Win Plus+, NEC-Win Pro, GNEC, Antenna Model (Teri Software), and 4nec2. Dan’s website states that “Multi-Nec is an Excel application that can make multiple simulation runs of an antenna while automatically changing one or more aspects of the model between runs. Run antenna modeling programs on autopilot”. I seriously doubt if I could have complied all the plots and data on the phased array, as well as other antennas I have investigated, without the Multi-Nec concept of antenna modeling. Load up the spreadsheet and go visit with the family while Multi-Nec does all the work. I recommend it highly. I often use the brute force method of antenna modeling … let the computer do the grunt work to make many small incremental changes in specific antenna parameters, such as phase angle and current ratios, and then evaluate the results by looking at the antenna patterns, feedpoint impedances, take-off angle, gain, front-to-back, front-to-rear, etc. After enough iterations, it becomes apparent which changes are beneficial and which are not. I like to design while observing the elevation pattern, especially the backside of the pattern, which determines the front-to-rear ratio. It should be noted that front-to-back is only specified for an azimuth pattern, which of course is a 2-dimensional slice through the 3- dimensional pattern. Front-to-rear, however, is a ratio of the forward energy versus the energy off the back of the antenna. Front-to-rear ratio is typically a less impressive number in decibels than the front-to-back ratio of a single slice of the pattern. Enough pontificating, let’s look at some patterns and numbers. 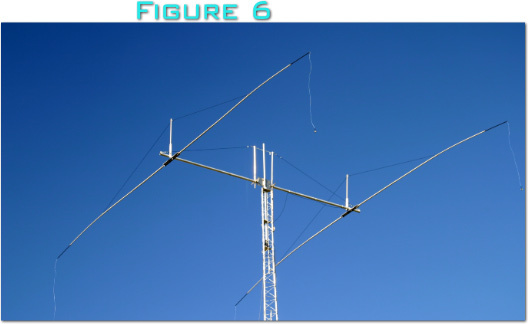 For the two-element phased array investigated in Multi-Nec I used #12 copper wire elements, 66 feet per element, spaced at 22 feet, and 70 feet high over average soil. I used 150 segments per wavelength and current sources in the middle of each element. Figures 1 through 4 below are combination 3-dimensional pattern plots, 2-dimensional elevation pattern plots, and 2-dimensional azimuth plots of the two-element horizontal phased array at selected current phase relationships between the two elements. As you can see from the above plots, as the phase relationship between the elements vary, there are drastic changes in the rear lobes of the pattern. The frontal lobe, however, remains relatively unaffected by the changes in phase relationship between the elements. As the phase relationship increases from 128 degrees to 152 degrees, the null off the back of the antenna changes from 27 degrees to 61 degrees. This is how the operator can achieve maximum front-to-back in real time as the LC network is adjusted with the back of the antenna facing the incoming signal. If the incoming signal has a lot of multi-path and is arriving over a wide range of angles, the array will not exhibit as much front-to-back as it would if the incoming signal was arriving at a narrow range of angles. In the real world, of course, we don’t need high front-to-back on incoming signals, we need high front-to-back on interfering signals off the back side of the antenna. When working Europe from Louisiana all this front-to-back is wasted because there is nothing behind me but Mexico, and in the summertime, thunderstorms in the Gulf of Mexico. 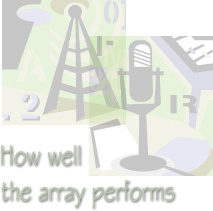 The ideal application for the phased array would be for New England stations working Europe who would like to knock down the rest of the United States stations by 30 – 40 db. Or, if these New England stations were working the United States, they could knock down the European broadcast stations by the same 30 – 40 db. The same would apply to the Northwest Pacific stations as they work Japan, or the West Coast stations working into the Pacific region. In summary, Figure 5 below illustrates front-to-back (red curve) at specific arrival angles (yellow curve) of the incoming signal, plotted against phase relationship between the elements. 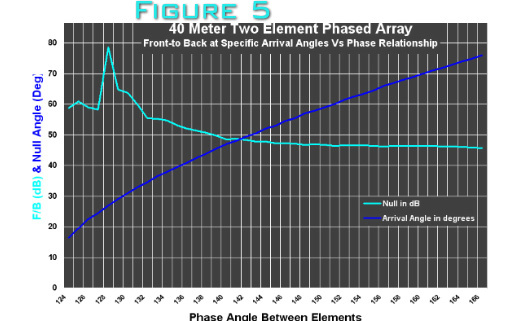 Although the null off the back of the phased array is greater than 45 db from signals arriving at angles of 18 degrees to 78 degrees, the maximum front-to-back (70 – 80 db) occurs at arrival angles of 27 – 30 degrees. As a practical matter these phased arrays can also be linear loaded. I use the droopy tail method of linear loading for my array that is pictured in Figure 6 below. Close-up of the boom to element, boom to mast and drooping tail. 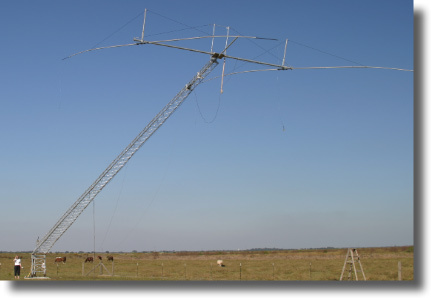 The above photograph shows how the phased array rotates in the boom sleeve bearing so that it maintains correct position as the tilt over tower goes from horizontal to vertical. That's 72 feet of tower and antenna being tilted over on a 1.25" screw mechanism at the 4 foot level. Pretty impressive, huh? The radiating elements are made of #13 copperweld wire running through tapered fiberglass tubing. The tubing is 1.5 inches at the center and tapers down to 0.5 inch at the ends. The tubing is 50 feet end-to-end, so there is about 8 feet of wire hanging straight down from the tips of each element, stabilized with fishing weights or large bolts to keep them from flopping around in the wind. 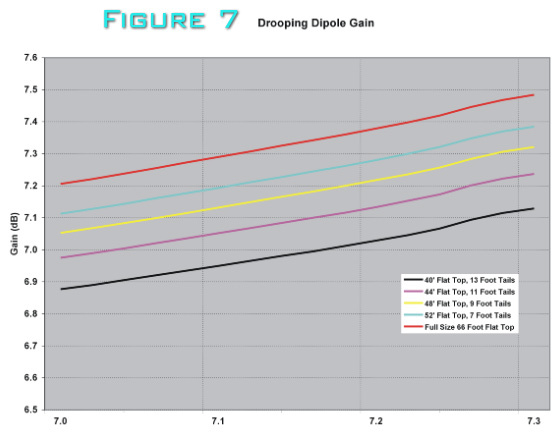 This form of linear loading is the most efficient that I tested in modeling software, being only 0.12 db down from a full-size, flat-top dipole made of the same wire at the same height. Figure 7 below illustrates the gain loss as a result of size reduction using this form of linear loading. As you can see, significant size reduction is possible with only modest loss of performance. This method of linear loading also avoids the problem of placing lossy coils in the high current part of the radiating element, as well as avoiding linear loading wires folding back on themselves in the high current part of the radiating element. Do not attempt to match the elements in any way at the feedpoint. Resist the temptation to control the SWR in either leg of the array, simply use an antenna tuner between the LC network and the transmitter. Depending on the phase relationships between the elements, the resultant SWR on the transmitter side of the LC phasing network will be about 2.5 to 1. This will not incur a terrible amount of loss over the matched condition in good quality coax at 7 Mhz. The only feedpoint improvement I can recommend is ferrite beads on the outside of the coax to eliminate currents on the coax shield, for this will reduce the front-to-back performance of the array. Best wishes if you decide to try the antenna.